The UK Schools Chess Challenge, sponsored by Delancey, the specialist real estate investment and advisory company, celebrated its 20th year in 2015. From its start in 1996, when 23,000 children from 700 schools and clubs entered, Mike Basman's dream of organising the largest chess tournament in the world has come to fruition. By 2006 numbers had increased to 74,000. Since then, the total entering has declined a little, but still attracts more than 50,000 children from around the UK. A dozen Suffolk schools entered, as well as the Bury Knights Junior Chess Club. Local rounds are followed by a regional round (the 'Megafinal'), held at Woodbridge School for Suffolk entrants. Top scorers are then invited to the 'Gigafinal', which for Suffolk players is held in Manchester (a second Gigafinal is held in Reading for southern counties). 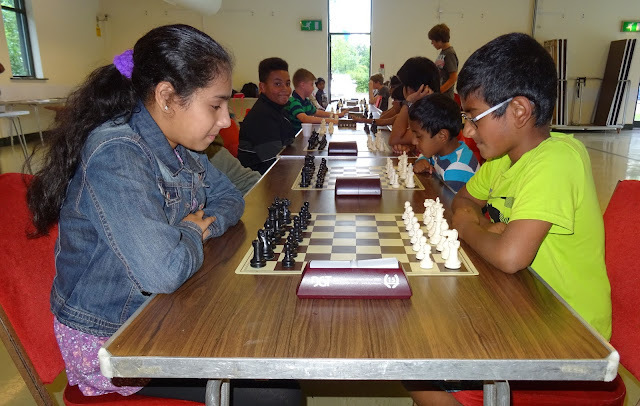 At the Terafinal, both Adam and Anita won their first games. 9-year old Adam, graded 93 ECF, faced 157-graded Peter Isaksen from Berkshire, who is three years older. In trouble early on, Adam mixed things up and forced Peter into a number of long thinks. In time trouble, Adam's opponent made a number of poor moves. In the following position, Adam (White) played 1. Nd2. The game continued ... Kf6 2. Nb3 g5? (the king needs to defend c6) 3. Nd4 g4 4. Nxc6 gxf3+? 5. Kxf3 Kg5? 6. Nd4 Kf6 7. Ne2 Kg5? 8. Ng1 Kf6 9. Nh3 Ke5 10. Nxf4 winning easily. Unfortunately, Adam's first round win meant that he lost his next three games against higher graded opponents (159, 136, 117), but he finished with a draw and a win to score 2½ points. Anita continued L,W,L,W,L, losing to three high-graded opponents (181, 166, 176) to finish on 3/6. These were excellent results for both Adam and Anita, with a 103 performance for Adam and 141 for Anita.